First I wanted to say that I have had a lot of fun digging back into Software Defined Datacenter, (SDDC). If you have not been able to tell I dove back in feet first with my recent vCloud Director Hybrid Cloud Case Study which I will also be presenting on the vBrown Bag this week. Something I discussed in the process I glazed over quickly was that I discovered you can actually configure the vShield Edge Gateway for NON standard IP Protocols using the vCloud UI. I even talked to a customer about this and they did not know it was possible. I stumbled on it through a blind test, so let me explain. In the View PCoIP on vCloud Director ost the other day I had this screen shot of the firewall rules. The reason I was messing with this is that the new VMware View 5.1 Security Server to Connection Server link is secured with IPSEC. I had all the other things open per the documentation except something known as “IP Protocol 50 – ESP”. When the rule was ANY-ANY it worked but I could not for the life of me figure out how to add a new Protocol Rule. Then it occurred to me that in the “Source” and “Destination” Port fields we can type anything we want, so why not give it a try here. I did a little digging and found this VERY useful listing of the IP Protocol Numbers and names that gave me both the IP Protocol Number and Name for ESP. SO I took a shot in the dark and entered “ESP” in the field, and low and behold….it worked! I have not tested using the IP Protocol numbers, yet but I suspect that may work too. 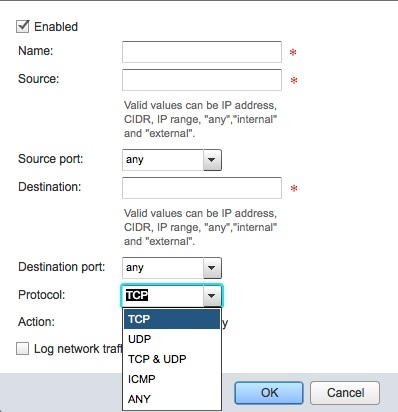 As best I can tell I’m not sure if this is “well” documented or not in the vCloud Director guides, but now I keep that IP Protocol link handy and I know I can now add BOTH custom ports and protocols to my vCloud Director Edge Gateway Firewall rules. I always knew the port numbers were capable of being typed in. I’m not sure if I was the only one to not know the Protocol field worked the same way but I certainly did not find any information to the effect after searching for a few hours on it. I hope this helps others leverage the new 5.1 vCloud Director Edge Gateway Services. Thanks for the info. Was looking for this very thing. But how do we do PAT (port address translation) for the nonpredifend ports? I would like to do a DNAT for 3389 (RDP) or 25 (SMTP). I would also like to enable SSL VPN-Plus. I see we can do all this through VSM but not through vCloud Director. Thanks. I would think you can type in the non standard ports anyway but I have not done a PAT. From what I have learned, you are able to type the ports in pretty much anywhere, but only if the options are even in the UI or API. I’ve no idea on the SSL VPN I did not configure that.